A new report from WWF and The Boston Consulting Group (BCG) finds that the overall value of the Mediterranean Sea’s natural assets is at least US$5.6 trillion but it is deteriorating. Rome, Italy – Along its 46,000km coastline, the Mediterranean Sea supports around 150 million people. The report Reviving the Economy of the Mediterranean Sea: Actions for a sustainable future, launched today, shows that the Mediterranean Sea plays a fundamental role in the region’s economy but that the sea’s underlying natural asset base—which supports much of the economy and community wellbeing—is eroding. The report, produced by WWF in association with The Boston Consulting Group (BCG), is the most focused review yet of the Mediterranean Sea’s natural asset base. It reveals the enormous benefits that the Mediterranean Sea brings to the region’s economy and proposes six strategic priorities to achieve a sustainable future for the Mediterranean. The report maps the contribution of the sea to the region in new ways and finds that the overall value of the Mediterranean’s natural assets is at least US$5.6 trillion. This value draws on assets including productive coastlines, fisheries and seagrass. The sea’s annual estimated economic output is at least US$450 billion. If the Mediterranean Sea was its own economy, it would be the fifth largest in the region—bigger than most of the region’s national economies—generating about as much annual economic output as Algeria, Greece and Morocco combined. The report also reveals, however, that many principal assets in the Mediterranean Sea are declining because of unsustainable exploitation and that the use of these resources is accelerating. The report focuses on the fisheries sector and the rapidly growing tourism industry and shows that the health of the Mediterranean Sea is at a turning point. “This new analysis adds considerable weight to the case for conservation to be an even higher priority for Mediterranean leaders. 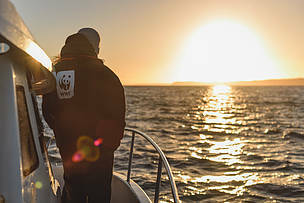 We have seen good commitments in the past but an objective analysis shows that we are running out of time and that we need action on a much greater scale and urgency if we are to ensure a healthy and prosperous future for the Mediterranean” said Demetres Karavellas, CEO of WWF-Greece. ”We are seeing many fish populations, coastal areas and ocean ecosystems coming under immense pressure around the world and in important regions like the Mediterranean. We also are witnessing an unprecedented focus on the ocean, and leaders in the Mediterranean and beyond can seize this moment to commit to the achievement of the UN Sustainable Development Goals and the global climate agreement of 2015. There is no time to lose.” adds John Tanzer, Leader for Oceans at WWF. For two sectors, fisheries and tourism, the report offers recommendations for policy makers, investors and developers to improve their sustainability and to shift towards a Blue Economy development model that will sustain ocean assets and contribute to the region’s prosperity. Tourism is the greatest contributor to the region’s economies, accounting for 11% of Mediterranean countries’ cumulative gross domestic product (GDP). However, the current mass tourism model—which often involves aggressive coastal development, excessive water and energy consumption and unsustainable management of solid waste and sewage—has degraded both the marine and the coastal environment. Tourism, according to the report, represents more than 90% of the annual ocean-based economic output of the Mediterranean. A predicted growth in tourism will lead to potential conflicts for the use of space in coastal areas. The Mediterranean fisheries sector, another key contributor to the region’s economy, has been in a deepening crisis in recent years. It still has an estimated collective worth of over US$3 billion and directly employs more than 180,000 people. The European Commissioner for the Environment, Maritime Affairs and Fisheries, Karmenu Vella, wrote the foreword to the new report and the launch is timed to foster conversation at the Our Ocean conference in Malta in early October, hosted by the European Union. WWF will hold a side event at the conference to present the key findings of the report.